I was profoundly influenced by the Dominican Friars who served in St. Dominic parish in Lagos. I admired the discipline of their lives and their selfless concern for their parishioners. My participation in the parish life there influenced me more than anything else. It shaped and widened my understanding of the Catholic faith and its doctrine. I also observed priests and religious who appeared genuinely happy in their vocation. It is from such motivations that I began to wonder, “It is possible that God is calling me?” Besides, I was very close to several priests and religious who encouraged me in my discernment. Then there were my mother and siblings, who were very supportive in my journey. It is funny how things don’t work out the way you think they will. I began to think and pray about my interest in the Franciscan life after a vocation weekend in a Salesian house of formation in Nigeria. Something told me that I could not dismiss my interest so quickly. And so, when I was invited by the Capuchin Friars in Onitsha, Nigeria, for come and see experience in 2004 there was a feeling that this was where I needed to be. 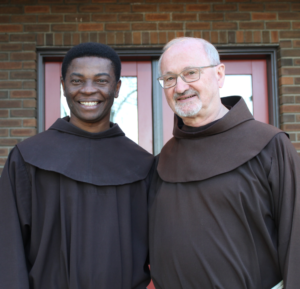 What followed was a very unusual situation: after several years in temporary vows with the Capuchin Friars in his home country of Nigeria, he found himself unable to continue with them, for reasons entirely beyond his control. However, he had a good friend who had been in a similar situation and who had also refused to give up: Father Sylvester, who is now serving as a diocesan priest in the Diocese of Nelson, BC. Consider Canada, was Fr. Sylvester’s advice. In this way, a relationship slowly built between Br. Michael and the Franciscan Friars of Western Canada, and he arrived in July of 2015 for a first extended visit. This was followed by his formal postulancy program and his novitiate year with us, which is now completed with the profession of his first vows. Br. Michael already has a BA in philosophy from the University of Ibadan and a BTh from Bigard Memorial Seminary in Nigeria, which is an affiliate of the Pontifical Urban University in Rome. He now continues his formation as a Franciscan while he studies towards a Master of Theology degree at Newman Theological College, with a specialization in systematic theology.